Got good views of the bunk house Saddlebacks just around the back of the ablutions building just after using it, along with a Robin in the same area. New Zealand Pigeons were often seen in flight, and a walk along the Totaranui Track almost always had a Robin either in view or earshot. The strange and sad thing about the reserve is that developments seem to have stopped about 5 years ago, when Robins and Saddlebacks were introduced. There is a lot of undeveloped potential in this great-looking bush for re-introductions of all sorts of vertebrates and invertebrates (though the presence of lots of Saddlebacks might make some reintroductions potentially interesting). Peter Frost met up with us at nearby Kai-Iwi for a whistle-stop tour of the wetlands between there and Wanganui, looking at the lake in the Bason Botanic Gardens where Coot and Shoveler were in the well-set-out surroundings, then the less tidy but larger Westmere Lake with Dabchick and more waterfowl of the same ilk as Bason. 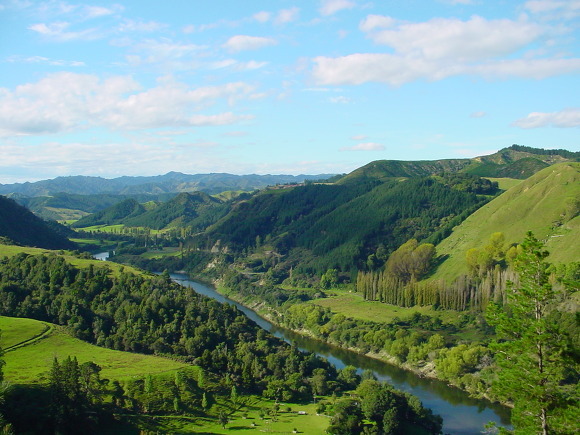 The Whanganui River Mouth is a well-watched estuary deep in Headhunters territory (not that I saw any rabble-rousers). Small numbers of birds were present, with fairly distant waders (the tide was out) and a few shags. Victoria Park Lake was the next stop, with its semi-feral Mute Swans (the Council nurture them) and Little/Little Black Shag colony. All allowed good views. The café is also worthy of mention, being very family friendly with good food and drink at a reasonable price (Christchurch Botanic Gardens should take note). Thanks to Paul Gibson for taking time out from work to show us round the park. I had been wanting to visit Kapiti Island for a number of years. Today my wish was to come true. 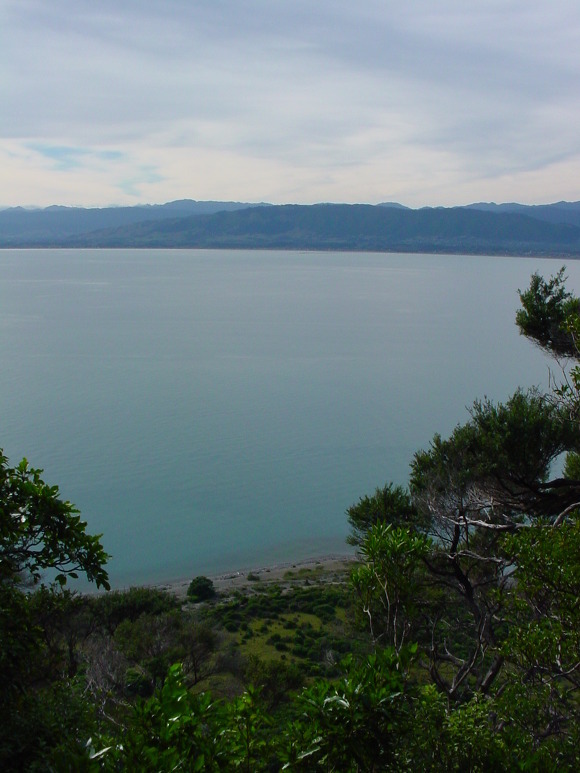 With light zephyrs and an almost flat sea there was no way the boat could not easily glide across that narrow bit of water separating it from Paraparaumu. It was with much expectation and excitement that I stepped onto the gravel beach and followed the crowd to the information shelter. 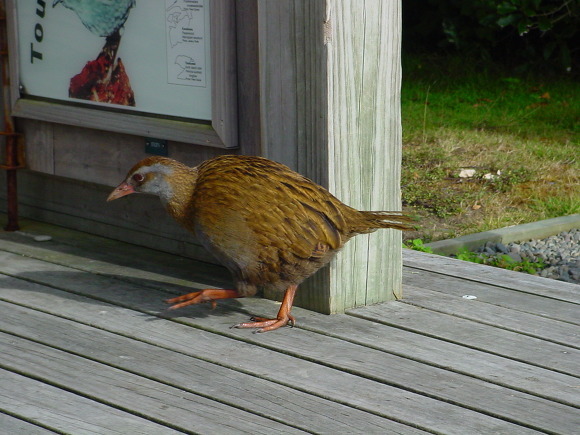 A Weka appeared much to the delight of Olivia, who couldn’t resist but chase it back into the undergrowth, much to the amusement of the audience, who had just been told what the hooks above Weka height on the side of the shelter were for. 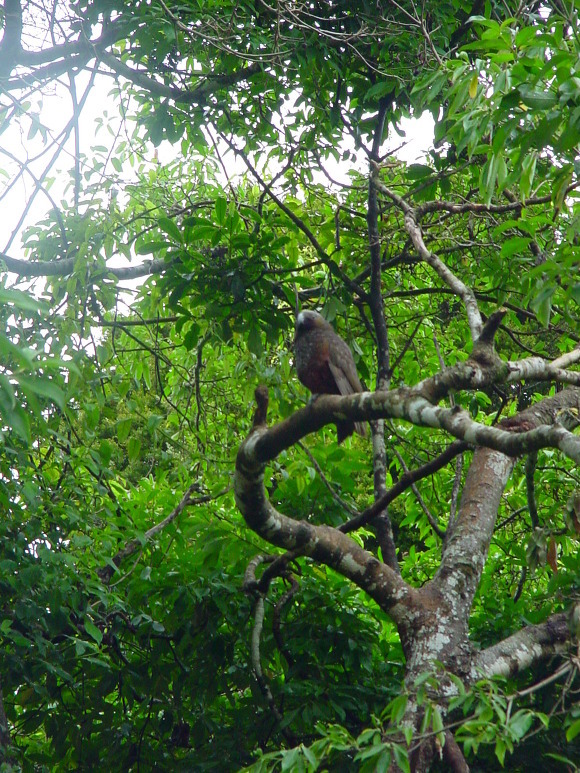 Tui were chasing about, Saddlebacks, Robins, Whiteheads, parakeets and Kaka called, NZ Pigeons swooped. After the talk the trampers were off up the Wilkinsons Track like a shot. We were much slower. I was less than impressed by the bush, and even lesser so by the track, and ended up wondering what all the fuss over Kapiti was about. 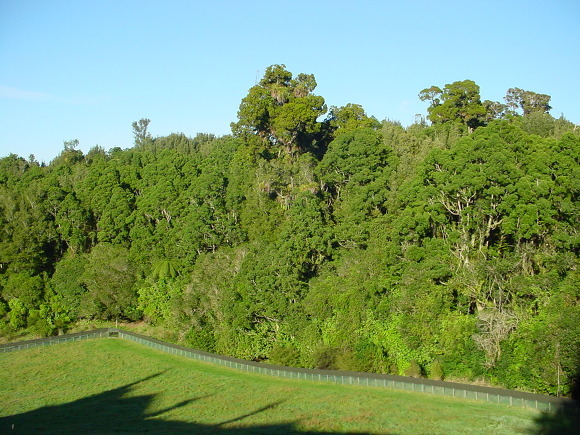 The bush is mostly scrubby and fairly low, with good forest only in gullies – but unlike Tiri (a similar mix of scrub and gully primary growth) there are fewer birds and the track is steeper and less well made – and unrelentingly uphill. There are 35 zigs and zags of the track to the Stitchbird feeder half way to the top of Wilkinsons Track. It takes about an hour to walk that far. I get there and the wasps are having a wild drunken party on the sugar water. A Stitchbird calls just a couple of hundred metres up the track and I find it (a female) seemingly attached to a post-breeding Whitehead flock. No birds are feeding on the sugar water as I pass the feeder again – they would have to fight off the wasps to get to the grog. A pair of Saddlebacks show well on the way down. Some birders carrying lunch going up ask where the feeder and seat is. I tell them I wouldn’t sit anywhere near the feeder if I was them. Back on the flats I find Hyeza and Olivia and finally cure Olivia of her fear of breaking waves in the little cove near the shelter. It’s her pulling me deeper into the sea after a bit – oh and the sea tastes ‘yuk’. We settle down to a bit of island time. Maybe the best way to see Kapiti is to stay on the flats, or only go a short way up the track. It’s quite relaxing being on the beach being serenaded by the birds and seeing them fly around, if at some distance. Wasps eventually find us and send us on our way. I walk the tracks on the flat in the hope of seeing Takahe, but fail, only seeing its smaller cousins Pukeko and Weka, however I am impressed at the number of New Zealand Pipits on and near the beach. Leaving Kapiti I’m left wondering why you would bother going there to see birds when you can see almost all the same species easier at Zealandia down the road in Wellington. No hassles with the permit, no hassles with the ferry and the weather, no long steep (and sometimes slippery) track to climb, no need to be marooned for 6 hours. I can’t say I’ll be in a great rush to head back. It’s great the place is free of mammalian predators, but those wasps sure need dealing to – they’re a menace to the birds, the invertebrate prey the birds feed on and to human visitors. It’s a bit strange that Rifleman isn’t present, and Fernbird – though admittedly Zealandia doesn’t have them either. Stitchbird seems to be really struggling based on what I saw/heard and I’m surprised Kokako aren’t more plentiful – perhaps the Harriers I saw are having some effect on them like they do on Tiri, but also the habitat perhaps isn’t the best either. There wasn’t much sign of seabird use of the bush, which perhaps could be encouraged by DoC. Some people complain of many fenced and island reserves being like zoos and this being a reason to visit places like Kapiti – well imho Kapiti ain’t no different – an ex farm with a few bush fragments let go back to wild, with most of its native birds reintroduced. The only difference is that it’s been a reserve longer. The rain pours down overnight, and though there is a lull it is a really soggy job to pack away the tent. We head back north to Foxton hoping to show Olivia the doll museum, but it has closed, the trolleybuses weren’t running and the flaxstripper opens for only a couple of hours in the afternoon – all that stripping must be tiring. About the only thing of interest open is the windmill. Hyeza buys some bolle bolle mixture. It’s going to be entertaining deciphering the entirely Dutch instructions to make them. There is something similar with the same (but Koreanised) name in her home country. With showers still coming through and Foxton pretty much closed we head for the beach, arriving with the tide out. Some Pacific Golden Plovers and other Arctic waders were showing fairly well, but few birds generally were on display. Hope to get back to this site soon at the right state of the tide! 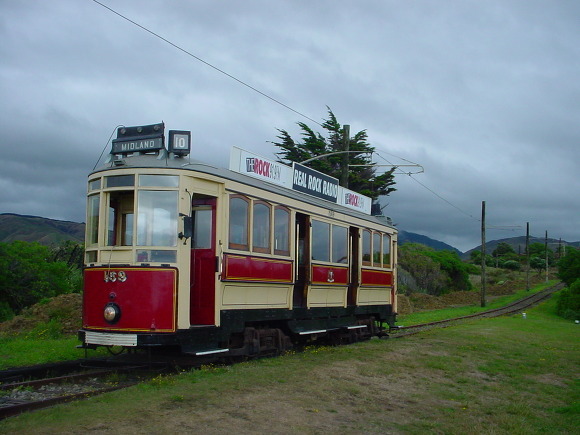 We head for Wellington stopping on the way at QEII for a tram ride (another of my passions) and a hoped-for lunch at a café that would surely be there – it’s a popular seaside park after all. Obviously it’s not popular enough and we dine on chippies and juice bought at the tram kiosk. Zealandia is reached about 2.30. At least it has stopped raining. The place is alive with Tui flying over, and a few NZ Pigeons, even before we enter the impressive entrance building and go through the high-tech turnstiles to get into the reserve proper. Olivia has great fun with the doors she can open to see interpretive displays and buttons she can press, though I’m not so sure she enjoyed the Kaka beak display that, as in real life, latched onto her finger – though thankfully it didn’t draw blood. On reaching the top of the lower reservoir a Takahe was out showing itself off on the lawn – at least until Olivia tried to go and pet it. Tuataras were on show behind the inner fence. Kaka perched in close view at the feeders and near the upper reservoir Stitchbirds were seemingly the commonest bird, zooming around hither and thither. Coming back down 2 Falcons could be heard unseen above the canopy of trees as they seemingly flew across valley and tell-tale ripples in the swampy area at the head of the lower reservoir eventually revealed themselves to be a small flock of Brown Teal. As per my previous visit Saddleback and Whitehead were heard well, but difficult to see, and this time I missed out on Weka, which are apparently still present according to the website but which are missed off the leaflet. The reserve is a great place for families to visit, and a great place to see birds well. We overnight in Plimmerton in a huge old wooden boarding house that has reassuringly withstood 2 magnitude 7 quakes. Perhaps less reassuring is the owners advice, should there be another, to get out quick once the shaking has stopped and run like hell up the hill away from it’s seafront location, presumably all in the pitch black like the 1st Christchurch one. I’m not so sure I’d be waiting for the shaking to stop before starting to head for higher ground. The ferry back south is a bit less calm than the one a fortnight before, with a reasonable northerly blow to stir things up a bit. Not that there were that many birds though. A band of a few hundred Fluttering Shearwaters is passed through on leaving Wellington Harbour, and there are a few White-capped Mollymawks and one Salvins mostly mid-channel. Other than the Flutterers Shearwaters are represented by a few Sooties, one or two Hutton’s and Flesh-foots and a subantarctic Little. Grey-faced Petrels were fairly regular showing well their towering flight patterns and a couple of small flocks of Common Diving Petrels overtook the boat after seemingly flying alongside in its lee for a while. Where are the giant petrels and Cape Pigeons, though, these days? 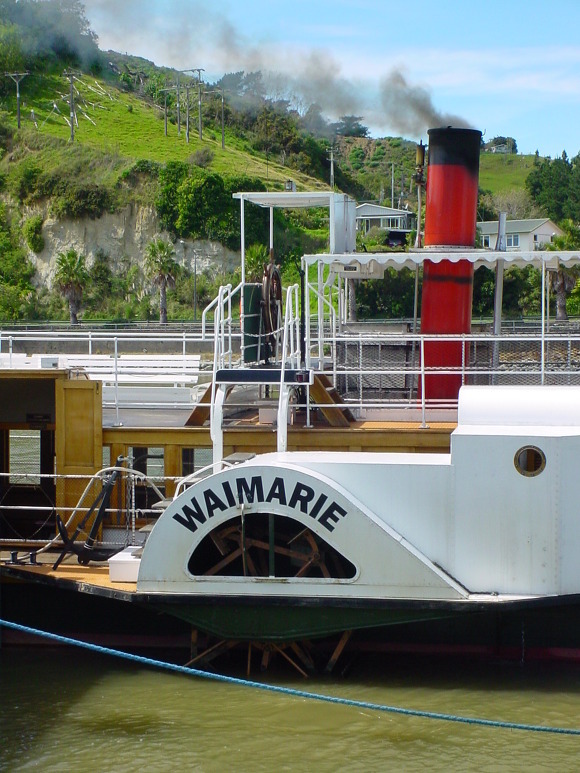 From memory they used to be a regular feature of every Cook Strait crossing, following the wake as well as fly-bys.